A 30-10 map (ca. 2010) on display at a Metro information table. The Los Angeles Chapter of the Urban Land Institute held a conference in Pasadena on Thursday to discuss transit-oriented development in the greater-L.A. area. The aim of the conference was to figure out a way to put more development around transit hubs. It’s a strategy embraced in many places to promote alternatives to driving and provide housing closer to jobs. There is also evidence it’s already taking hold here in Los Angeles County. Thousands of units of new housing near transit have sprouted in North Hollywood, Hollywood, Koreatown, Long Beach, downtown Los Angeles and Pasadena in recent years. That said, there are many places along the Metro Rail system where there has been little or no development. Metro played a big role at the conference because it’s involved in building transit-oriented developments on land it owns near rail and bus stops. The speakers on the panel were Richard Thorpe, CEO of the Expo Construction Authority, Habib Balian, CEO of the Gold Line Foothill Extension Construction Authority and Martha Welborne, Executive Director of Countywide Planning at Metro. 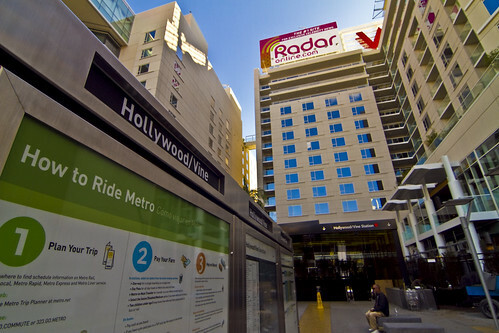 A TOD at the Hollywood/Vine Red Line station. Not all TODs look alike. They should be tailored to suit their surrounding community. Photo by Fred Camino. The panel was chaired by Metro and Metrolink Board Member Richard Katz, who reaffirmed the importance of persuading Congress to approve of America Fast Forward (aka the 30/10 Initiative) to accelerate 30 years of Metro projects into 10 years. He called it the “largest economic stimulus package in the country” and emphasized the importance of implementing a “local hire” plan, so that L.A. County taxpayers and workers benefit as much as possible. On the TOD front, Katz noted that Metro is “laying the foundation” — as these Measure R projects come on line, there will be more housing and destinations along the lines. The challenge for Metro, he said, is to introduce these new features into existing communities, which have their own unique character and interests — and, truth be told, don’t always want them. Welborne picked up that thread. In the first decade of Measure R, the Expo Line, Foothill Extension and Crenshaw Lines will all be finished, spreading the reach of Metro rail. And the linchpin of the light rail system, the Regional Connector, should open in downtown L.A. around 2019. According to Welborne, that one 1.9-mile piece — which will connect the Gold, Expo and Blue Lines — will “light up ridership on the whole system,” because it will reduce transfers and make direct travel across the region faster and easier. Welborne then discussed Union Station, calling it “the mother of all TODs.” Along with the station itself, Metro recently purchased 38 acres surrounding it and roughly 5.9 million square feet in entitlements — in other words, the development rights to build the equivalent of several large towers. According to Welborne, the first two steps are as follows: Metro will have an open call to developers in the near future, requesting that they submit their interest and qualifications for developing the property. From there, four to five will be chosen and asked to present their preliminary vision, while the community weighs in with its own hopes and goals. Metro would then choose a developer and move forward, though that’s still many years away. Many cities along the line are laying the groundwork for new developments around their proposed stations. For example, Monrovia is planning 1,400 residential units in a small village around a to-be-revitalized historic depot. Along the Foothill Extension, there are some 1,200 acres of infill opportunities, which could accommodate 17,000 residential units, three million square feet of retail and 7.5 million square feet of office space — roughly equivalent to downtown L.A., said Balian, but spread over the 11-mile corridor. Though it’s highly unlikely all of that will be realized any time soon, it gives a good sense of the scale of transit oriented development potential. Along Phase I, the Lorenzo Project is already underway, which will add roughly 1,400 residential units and retail space near the 23rd Street Expo Station. The Glass Tower project at La Cienega/Jefferson station includes two 15-story office towers. One stop to the west, Legado Crossing — a four-story mixed-use project — will break ground at Culver City Station later this year. On the Phase II end, there’s the proposed Casden Properties project at Expo and Sepulveda. And at the line’s terminus, the city of Santa Monica and Expo are exploring a station design — which will sit on a block-sized parcel — that maximizes space available for a transit-oriented development. There was also a lunchtime presentation from Christopher Leinberger, visiting fellow at the Brookings Institution’s Metropolitan Policy Program. He started his talk with praise for America Fast Forward and a word of encouragement for L.A. County: “You’ve already done the hard part,” referring to the passage of the Measure R sales tax. The priority for the county going forward should be to identify “60 regionally significant, walkable urban places,” to concentrate TODs, according to Leinberger. At the same time, he said it was important to include affordable housing. In his view, there is a lot of pent up demand for housing near transit and in walkable neighborhoods and that’s pricing out some people from new units in, for example, downtown Pasadena. Ultimately, the day’s events covered a lot of territory — here’s the agenda [PDF] — but left me with a number of questions: What is holding up TOD along existing Metro Rail lines that don’t have them? How will Metro Rail’s expansion change the value of living close to rail lines and communities’ attitudes towards TOD? And, what lessons can we learn from successful TODs around the country and world? If you know of any exceptional transit-oriented developments, feel free to share them in the comments section. In the meantime, we’ll try to keep you posted on new TODs in our area. That’s an interesting routing for West Santa Ana branch… the ROW ends near Rosecrans/Garfield so I’m not sure how Metro will plan on extending the line to Long Beach Blvd Green line station and then all the way to Union Station via Pico/Aliso station on the Gold line. One concept that is being considered (especially if commuter rail is chosen) is using the UP San Pedro Subdivision between the West Santa Ana Branch ROW and Metrolink’s East Bank Line (connecting to Union Station). I am a little confused regarding the 30/10 map shown in the picture. It says there are two options regarding the regional connector, one at grade and the other below grade. I am almost positive that the much more sensible below grade option was already chosen. I seriously hope metro is not reconsidering running at-grade trains through the middle of dense downtown. Is this just an outdated map? The 30/10 map appears to be a 2010 version that predates the Metro Board’s selection of a fully-underground route as the locally preferred alternative for the Regional Connector.